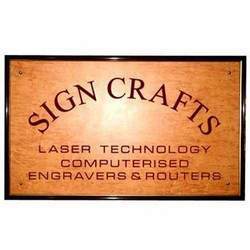 We deal in all kind of signages. Acrylic work, Steel Work or ACP work. Flex and Vinyl Printing etc. To meet the various requirements of the customers, we are involved in offering a wide assortment of Stainless Steel Name Board. Size of Biggest Letter: 3.5"
Plate Size: 18" x 12"
We are one of the finest artistic name board creators in Bangalore. Our clientile list includes many individual villas, apartments and business shops.